Johann Fritz was one of the most successful makers in the Vienna of the Classical period. Less renowned today than his contemporaries Anton Walter and Conrad Graf, he built pianos which, in terms of their sonority and as pieces of furniture, were perhaps the most truly elegant of any. His six-octave pianos, made from around 1810 to 1825, were particularly distinguished by their refined tonal registers, from reedy basses starting at FF, through mysterious tenor and fluty soprano ranges leading to lark-like trebles ascending to f4. Most surviving pianos have four pedals; una-corda (keyboard shift), moderator (tongues of cloth brought between hammer and string to produce a soft, sibillant sound), forte or damper-lifter, and a Janissary pedal producing at will bells alone, or bells, cymbal and bass drum – the latter being the soundboard itself! In addition, a knee-lever brings into play the bassoon stop, a roll of silk-covered paper upon which the bass strings buzz in imitation of that instrument. 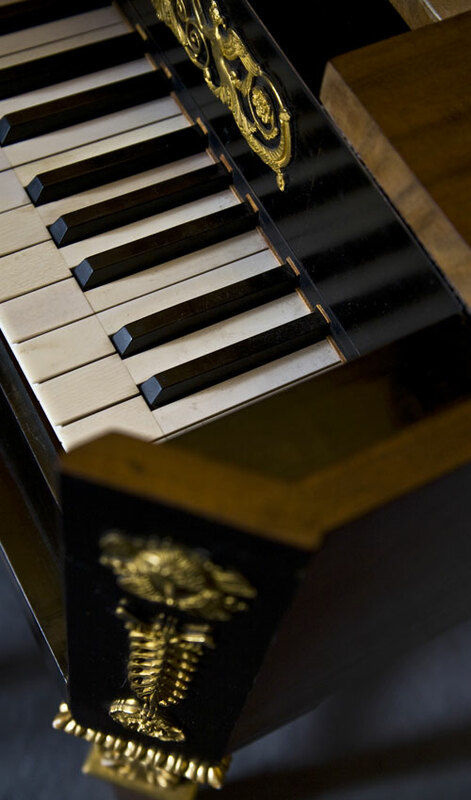 The ‘Viennese action’, in which the light, leather-covered hammers are mounted directly on the keys themselves, gives a direct and sensitive link between the player and the strings. 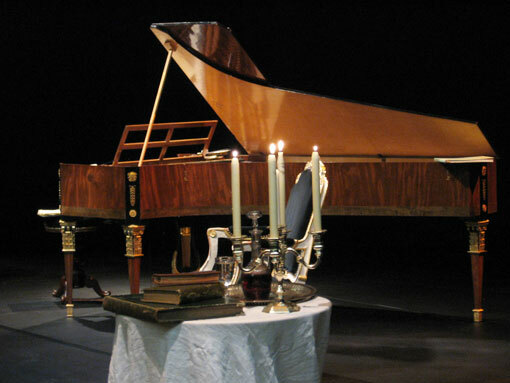 The instrument is a replica made in 1981 by Christopher Clarke of an original of about 1814, and which forms part of the Burnett collection at Finchcocks, in Kent, England. The case is in figured Spanish mahogany, maple and stained pearwood, decorated with carved, painted and gilt decoration to the legs and lyre, and ormolu mounts around the keyboard and above the legs. 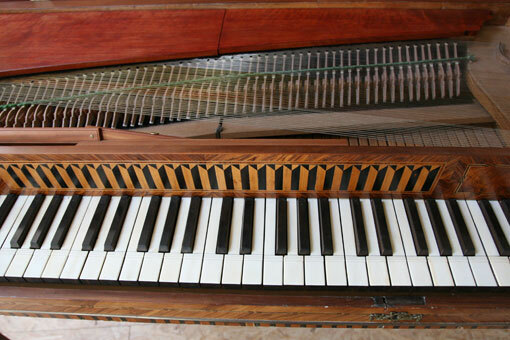 This square piano left the workshop of Johannes Bätz in 1789. Very little is known about this instrument maker from Frankfurt-am-Main, and this is the only instrument known to have been built by him. A label with the inscription “Johannes Bätz Frankfurth am Mayn im Marz 1789” is glued to the soundboard. The piano remained in the same French family from at least the early 19th century until recent times; it seems likely that the family ordered the instrument, which is notable for its ivory (rather than ebony) keyboard and the particularly refined marquetry of its case. 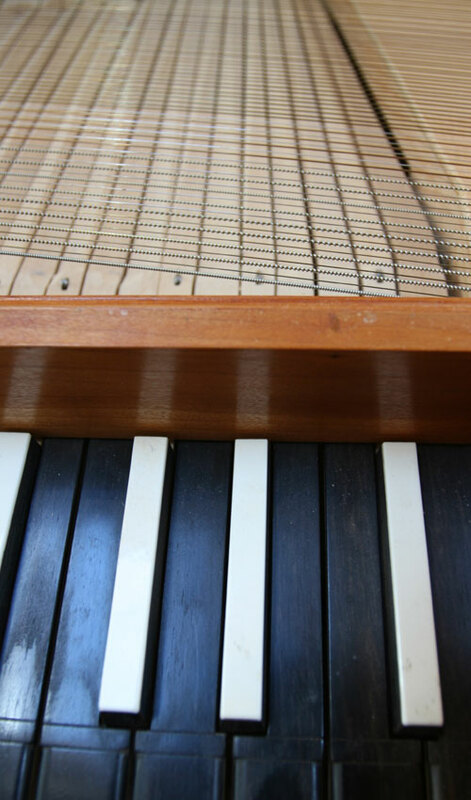 The piano has a round and flexible sound, and is able to express profound musical emotion. It has four knee levers. Two engage the forte ‘pedal’ (one knee lever corresponds to the half of the keyboard above middle C, while the other corresponds to the half below middle C). The other two engage the ‘lute’ or ‘buff’ stop. The piano was restored in Christopher Clarke’s workshop in 1991. 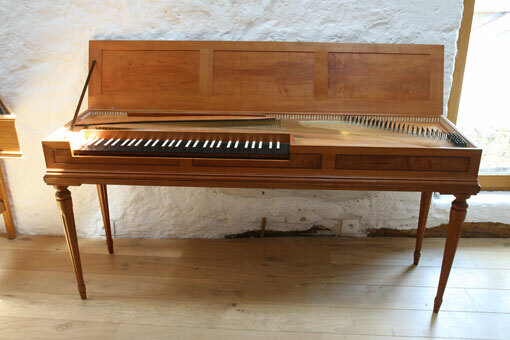 The unfretted, double-srung clavichord used in this recording is based on an instrument, dated 1772, built in Ansbach by Christian Gottlob Hubert and now in the Neumeyer Historical Keyboard Collection in Bad Krozingen, Germany. It was built in 1995 by Thomas Steiner in Basel, Switzerland. Christian Gottlob Hubert was born in 1714 in Fraustadt, Poland (known today as Wschowa). In 1740 he moved to Bayreuth following his appointment as court organ and instrument maker to the Margrave, Prince of Bayreuth. He accompanied the court on its relocation to Ansbach in 1769 and remained there for the rest of his life. In 1786 the historian Johann Georg Meusel wrote in his journal Miscellaneen artistischen Inhalts: “When in Ansbach, the observant traveller will take special care to meet Hubert, the famous instrument-maker. He is widely renowned for his durable clavichords and forte-pianos. All have the most beautiful tone. Hubert always has at hand various examples of his work; each instrument boasts a special design and the most artful construction. He is a very small man, of quiet and noble character, although rather headstrong and temperamental, and his work is accomplished with extraordinary accuracy”. Hubert died in 1793 in Ansbach. Hubert’s surviving instruments amply justify the favourable contemporary accounts of them. 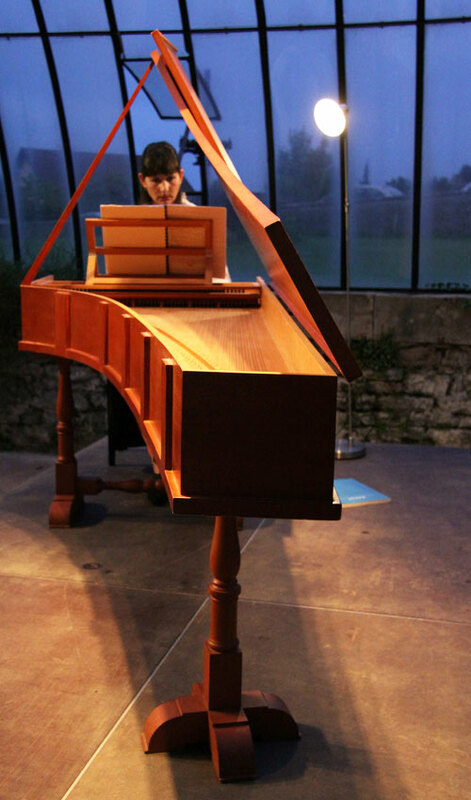 Nineteen clavichords are signed by Hubert or can clearly be attributed to his workshop. Three are unfretted (one pair of strings for every key), dated 1771, 1772, and 177(9?). Their common features are a relatively small case, narrow string band and short keylevers with tangents touching the strings close to their fixed points. As the keys fall to a firm stop at the moment when the tangents contact the strings, the performer experiences a great sense of control during sound production. These clavichords respond to the most subtle nuances of touch to produce a large range of dynamic shading and a wide tonal palette.